As a book reviewer, Gary K. Wolfe has made a lasting contribution to the science fiction field, producing an impressive oeuvre that is consistently intelligent, thoughtful, informed, and open-minded. That he can produce such work month in and month out, year after year in the pages of Locus is amazing, astounding, and fantastic. In the final chapter of his new collection of extended essays, Evaporating Genres , Wolfe ventures some distinctions between the terms "reviewer," "critic," "scholar," and "academic," noting that in general usage, "critic" and "reviewer" often get conflated, but within academia "critics may include theorists, savants, essayists, commentators, dissertation-writers, and even historians, but almost never reviewers" because reviewers are perceived to "lack the magisterial distancing from the text putatively required by the demands of scholarly synthesis" (p. 205). There is much to admire in Evaporating Genres , but this statement is problematic, not just because it feels a bit like it originates from some personal grudge more than from any general principle, but because it ignores the most fundamental difference between reviewers and critics—a distinction that is essential to appreciating the best qualities of Wolfe's book. Book reviews and critical essays are different beasts, their behaviors and morphologies most notably distinguished, it seems to me, not by distance or demands, but by a basic difference of audience: book reviews generally presume an audience that has not yet read the book under discussion, while critical essays generally presume an audience that has at least a passing familiarity with the major works discussed. There are, of course, exceptions and plenty of places where cross-breeding blurs the distinctions between species, but such exceptions and blurs don't blot out the norms, and few readers would mistake a review in Publisher's Weekly for an essay in Contemporary Literature . This is a distinction of type, not quality; there are brilliant and beautiful book reviews, idiotic and clumsy critical essays, and vice versa. I raise the distinction not just because it seems oddly missing from Wolfe's own discussion of the terms, but because Evaporating Genres is most profitably read as the work of an excellent book reviewer rather than the work of a literary critic. Wesleyan University Press has published some of the best literary criticism of science fiction in recent decades—the nonfiction of Samuel R. Delany, Justine Larbalestier's The Battle of the Sexes in Science Fiction (2002), Carl Freedman's Critical Theory and Science Fiction (200), John Reider's Colonialism and the Emergence of Science Fiction (2008), Farah Mendlesohn's anthology On Joanna Russ (2009), Istvan Csicsery-Ronay's The Seven Beauties of Science Fiction (2008)—and so when I began reading Evaporating Genres , I assumed it was part of this lineage. A third of the way through Wolfe's book, I found myself terribly frustrated, but I struggled to identify the cause. Wolfe's writing was supple and elegant, his knowledge of science fiction's history impressive, his ideas sane and reasonable. Yet reservations nagged at me; at the end of every chapter I thought, "Is that it?" and, worse, one observation after another made me ask, "So what?" without gaining a satisfying reply from the sentences that followed. Eventually, I wondered what the best audience for Evaporating Genres might be, and it was then I realized I was applying the wrong template of expectations to the text. This was my failure, not the book's. The ideal reader of Evaporating Genres , in my mind, is someone who has either just begun to explore the wonders and possibilities of science fiction, or someone who needs to be convinced that science fiction can be something other than formulaic pulp stories. This is simply the best book I've ever encountered for such readers. At the same time, though, because Wolfe is so well read in the field of SF, the book provides even very experienced readers with fascinating and insightful connections between texts. My failure when I started reading Evaporating Genres was in expecting it to offer a particular type of literary criticism, a type primarily concerned with insightful analysis of texts. What it provides in much more quantity is useful description. There is analysis, but it is only occasionally developed beyond a sentence or two—it is the sort of analysis provided by good book reviews: interesting, provocative, concise, but not thorough. The weakest chapters of the book are the few that most strive for analysis (the first chapter, "Malebolge, or the Ordnance of Genre," seems to me at best reductive and at worst an incoherent mess of unexamined assumptions). The best parts of the book are such chapters as "The Artifact as Icon in Science Fiction" and "Frontiers in Space" that describe thematic similarities between many texts. "The Artifact as Icon," for instance, offers a panoramic view of the way writers have used objects in stories to invest old images with new meanings and to reconcile what Wolfe calls SF's "oddly bifurcated history" of "drawing at once on ancient myth and modern technology, on pop culture and arcane science" (p. 83). This chapter shows the real value of a historical overview of texts, because by pointing out the affinities between such novels as Horace Walpole's The Castle of Otranto (1757), H. Rider Haggard's She (1887), Algis Budrys's Rogue Moon (1960), and Gregory Benford's Galactic Center series (1977-1995), Wolfe is able to illuminate particular textual practices and also to note a distinction between artifacts that exist simply as plot devices and artifacts that are more central to the books' meanings. Thus, at its best, description transcends categorization or listing to become a form of analysis itself. It is in such chapters that Wolfe's skill as a book reviewer is clearly evident, because it's a rare page in Evaporating Genres where the reader needs to be familiar with the text under discussion. Wolfe summarizes the plots of all the stories and books he discusses at any length, and deftly shows how those works fit into a general theme such as "stasis vs. chaos" or how they are exemplars of particular patterns in stories of apocalypse. A writer of different habits might explore the social and political implications of apocalyptic writing, but Wolfe is mostly content to stick to plot and basic themes. This is why Evaporating Genres could be a useful book for anyone who wants to find more stories like the stories they like. For instance, were you the sort of person who likes frontier stories, you would find many more such stories to read in the "Frontiers in Space" chapter, and you wouldn't encounter the sorts of social and political analysis in, for instance, Reider's Colonialism and the Emergence of Science Fiction that could, depending on your own politics, be a turn off or a bummer. Wolfe has a strong interest in history, but not so much in historicizing—not for him the radical imbrications of text and culture found in the criticism of, say, Fredric Jameson. Indeed, there is no evidence in Evaporating Genres that Wolfe has been influenced by any non-SF literary criticism published since about 1960. That will be relief to many ordinary readers, I expect, who would rather gouge their eyes out than read such stuff, but occasionally it's a real limitation of Wolfe's book, because at the title suggests, there is something of an argument to be found in and among these chapters. 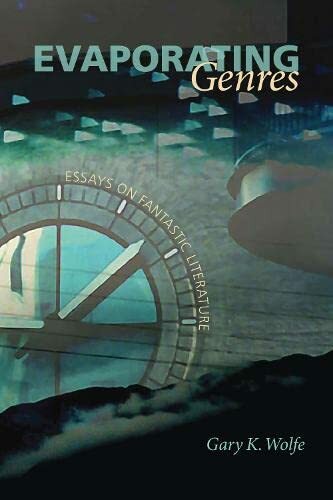 It is not a particularly didactic or coherent argument, and Wolfe is perfectly willing to let his ideas carry him away from it or even to contradict it—for instance, in "The Artifact as Icon in Science Fiction," he discusses magical artifacts in Jorge Luis Borges's stories in such a way that, were we to take the idea of genre and its evaporating boundaries seriously as presented elsewhere in the book, might imply that Borges was a genre fantasy writer. Borges's stories were often fantasies, but he wasn't a genre fantasy writer in any meaningful sense, nor do I think Wolfe would say he was. Instead, he uses Borges as a convenient and vivid example when he needs him instead of staying in lockstep to an overarching thesis. That seems to me an eminently reasonable decision. For book reviewers, certainly, it is best to try to describe a book accurately, to speculate on what a writer is attempting to do with a book, to discern as well as possible the audience for such a book, and to evaluate the book according to these ratiocinations. Personal taste inevitably affects the evaluation, of course, because reviewers are stuck within their own subjectivities, but an intelligent and well-read reviewer (such as Wolfe) is likely to provide something in addition to an idiosyncratic evaluation, and is also likely to have a subjectivity that is interesting in and of itself, whether one ultimately agrees with a particular evaluation or not. Wolfe's personal taste and reading experiences led him to choose the texts he chose to discuss in Evaporating Genres ; because his inclinations are toward plot and theme rather than, for instance, linguistic or ideological analysis, his writing would never be mistaken for that of Samuel R. Delany or Joanna Russ. This has nothing to do with whether one starts with a theory or not. One starts with a theory; this is unavoidable. Wolfe's theory in the above quotation is similar to that of the mid-twentieth century New Critics, who argued that every text should be considered as a tabula rasa; Wolfe does not posit the texts as tabulas rasa (his interest in history makes him interested in ancestries of plot and thematics), but rather the readers as such. According to Wolfe's theory, it is possible to step out of one's culture, language, and ideology and read a book purely within a textual environment—the world disappears, and only texts and their histories remain. My greatest disagreements with Wolfe's statements in Evaporating Genres are disagreements of theory; my own inclinations are just about the opposite of his, which is not to say that I read more theory than fiction, but that I don't see the prospective teacher's attitude as he represents it being either the beginning or ending of a conversation, nor do I accept the idea that one can read without theorizing. It was, in fact, a bit of bad theorizing that caused me frustration with Evaporating Genres at first, and when I revised my theory of the book's purpose and audience, I was able to gain more pleasure from it and find a way for it to make more meaning than it would have made for me otherwise. This is a very ordinary sort of theorizing, lacking the ambition and glitz of a grand unified theory of all written communication, but it's theorizing nonetheless. Theories determine what we see and what we don't. They help us sift through the infinite possibilities of life and history. What we choose to say about a book or a movie or a piece music or a moment in time is inevitably an illustration of a theory: a theory of what books, movies, and music do and should do, a theory of how the world works. Theories, too, provide us with a way to decide what is meaningful and what is not, what is worth saying and what deserves silence. As his title suggests, Wolfe wants to explore some of the ways in which genre fiction has, especially in the last few decades, become less bound by its conventions. Such an exploration requires some basic assumptions—that there is, for instance, something identifiable as "genre fiction," that this identifiable entity has been at some time bound by conventions, that those conventions have in some cases recently been weakened, and that this recent weakening is of a different kind from that of earlier moments (e.g. the New Wave[s] of the 1960s). Thus, previously stable genres may be now be "evaporating." This is a catchy idea, but because the assumptions buttressing it are not well examined within the book, the umbrella argument covering these essays is thin, making the virtues of the chapters individual. What Wolfe lacks is a coherent theory of genre. Not a definition so much as a description, for while Wolfe is skilled at describing specific texts, he is unable or unwilling to create a description of a genre such as science fiction or fantasy that can distinguish how, for instance, science fiction can include all sorts of utterly unscientific stories ( The Martian Chronicles ) but not Christian fundamentalism ("the most popular millennialist series of the 1990s, Tim LaHaye and Jerry B. Jenkins's Left Behind novels, was so steeped in Christian fundamentalism it could hardly count as science fiction" (pp. 101-2)). He cites non-supernatural books such as Peter Straub's Koko (1988) winning the World Fantasy Award as an example of genres evaporating, but also seems mystified by the phenomenon. There's no need to be mystified. Writers have been theorizing about genres of all sorts of different things for ages. For instance, we could grab a term used by scholars in linguistics, composition studies, and other disciplines: discourse communities. The Left Behind series is not science fiction not because it's full of Christian mythology, but because it is not a part of the SF discourse community; Koko is a perfectly good novel to win the World Fantasy Award because Peter Straub is a member of that community. Wolfe, because his theories rely on content (theme, plot) more than social and symbolic associations, lacks the coherent explanations for such phenomena that another theory would provide. This is not to say that a theory influenced by linguistics and other disciplines would be able to account for all the phenomena that Wolfe wants to discuss, however, nor that such a theory would not bring along a new set of problems—because by definition they sift and select, theories are always partial and incomplete, and in choosing theories what we choose is not only what we most want to discuss, but what we are most willing to leave out. Wolfe, for instance, shows no desire to discuss class. In the eponymous second chapter of Evaporating Genres , he conceives of something he calls "modernism" as exemplified by the reviewer and critic Edmund Wilson in The New Yorker magazine—Wolfe labels Wilson "the New Yorker 's high priest of modernism" (p. 25) and lets this explain Wilson's antipathy to the works of Agatha Christie, Dashiell Hammett, H. P. Lovecraft, and J. R. R. Tolkien. Though inevitably incomplete, a class analysis of high/low culture makes more sense of Wilson's sensibilities and of his presence in The New Yorker , a magazine designed for the upper class and, perhaps more significantly, anyone who aspired to that class. The need to preserve a distinction between high culture and low culture can as often be explained as a desire to keep the unwashed masses away as it can be explained as an iteration of some vague label like "modernism," but if your theory admits nothing of economics and sociology, and sticks only to texts, texts, texts, then sometimes empty labels are what you're left with. Evaporating Genres ends with an essay mostly about the unique phenomenon that is the reviewer and encyclopedist John Clute, and it is an essay that displays many of the best and worst qualities of the book as a whole. As a short history of the critical study of SF, it is brilliantly thorough and remarkably concise (though once again the limitations of Wolfe's interests belie any pose of objectivity: one of the most influential strains of SF criticism since the 1970s has been specifically feminist, but aside from a passing mention of Joanna Russ, this goes without notice). As a description of what makes Clute Clute, the essay is magisterial. It is not, though, an essay that limits itself to history or description; instead, it also offers a parallel narrative that reads like a grab bag of everything that causes Wolfe to be bitter about life, the universe, and everything. He does not seem to have had a very happy time in the groves of academe, and again and again throughout the essay he uses Clute's non-academic status as a cudgel against the various idiocies of academia in general. Such complaints have a long literary tradition, and might even be considered a genre unto themselves, but they seem oddly out of place here, as if the essay began as an angry letter to a tenure committee. That second sentence is impressive in its syntax and grammar, but its content is a big knot of resentments. It's an atypical sentence in this book, because the tone up until this essay has been judicious, measured, and thoughtful. It's as if Wolfe burped a bit of bile into his gullet and had to cough it out—spitting in the face of all those bloggers who don't have editors and who think they're smart enough to say something in public about books, and all those elitist reviewers who sneer and snigger (and who apparently agree with Samuel Delany that Literature and Paraliterature are separate categories), and all those pointy-headed scholars who read English with a French accent and want to make the entire world boring. To them all, Wolfe screams, "Get off my lawn!" Wolfe was right to chastise the young Latham for laying out a litmus test, but Budrys deserves just as much chastisement, as does Wolfe for his intemperate intolerance of online fans and enthusiastic amateurs. We'd be better off thinking about the world of reviewing and criticism not as a bordered field needing protection from interlopers, but as a complex ecology that gains strength from diversity. Wolfe is right, too, to celebrate Clute—he is a treasure, and he deserves every imaginable accolade. But we don't want everybody to be Clute. We want some to be pomo theory-heads, some to be enthusiastic common readers, some to be occasionally grumpy conservatives like Wolfe. We could use more of it all, in fact: more detail-obsessed encyclopedists with baroque personal vocabularies, more philosophical adventurers revealing the hidden assumptions between the lines, more ordinary folks just saying how much they loved (or hated!) a particular book or story, more elegantly eloquent describers and historians and reviewers. That's a recipe for a diverse, healthy ecology of readers and writers. A fine dialogue indeed, and one that Evaporating Genres contributes to with frequent grace. This is a really remarkable essay both in its argument and in its prose; I hope to have an opportunity to use it in the classroom someday. Great review! There is a lot to be thought about here - not least the practicalities of how we continue to promote this healthy ecology. Incisive argument cast in vigorous, elegant prose. What a joy!